Mosh4Life for Teenage Cancer Trust! 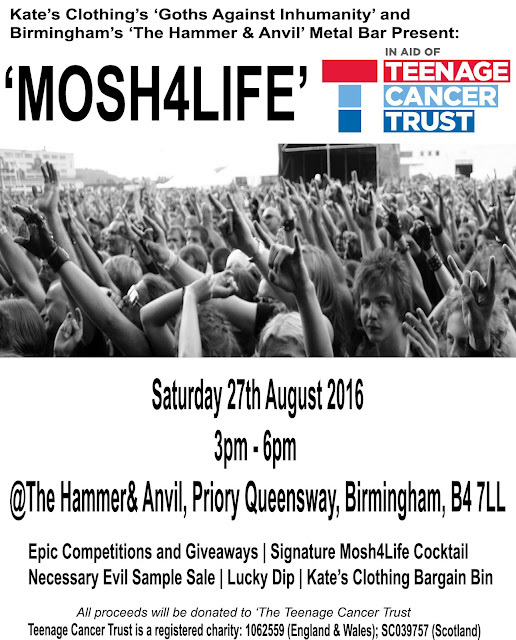 Our charitable arm ' Goths Against Inhumanity' are at it again, this time raising money for Teenage Cancer Trust! We have teamed up with Birmingham's newest and most exciting metal bar ' The Hammer And Anvil' to bring you an afternoon of incredible metal inspired fun to raise money for a cause that means a lot to all of us! Epic Competitions and Giveaways - We will be giving away some KC coupons and more! Necessary Evil Sample Sale - Grab yourself some brand new pieces of Necessary Evil Clothing for a 3rd of the price. The sale will include some pieces that are not even in the shops yet, and ALL the proceeds from the sale will go to Teenage Cancer Trust. Lucky Dip - Come on who doesn't love a lucky dip, and with us running it you know you're bound to get an awesome surprise! Kate's Clothing Bargain Bin - Snap up some end of line bargains and donate to a good cause while you're at it. Profits going to Teenage Cancer Trust of course! Exclusive Mosh4Life Cocktail - Need we say more! Join us for all of this plus as much metal moshing fun as you can handle! Also you can get an exclusive peek at the next Necessary Evil Collection... what's not to like! Say 'Yes' to our invite on Facebook HERE!